Is Maintaining “Too Big to Fail” a Conservative Imperative? Since the financial crisis of 2008, discussion of the role big banks play in the American economy and the inherent risk they represent has faded into the periphery. As with many other areas of public policy, a sustained focus beyond a time of crisis is difficult, due mainly to the relative lack of political will. In recent months, however, there has been a steady, yet relatively underground, effort to influence the fickle whims of the political class to take more notice of the financial tsunami still lurking in the shadows. As Ezra Klein noted in the Washington Post, the list of those who support breaking up the big banks includes former Morgan Stanley CEO Phil Purcell, head of the Dallas Federal Reserve, Richard Fisher, former IMF economist Simon Johnson, former FDIC Chairwoman Sheila Blair, and former Fed Chairs Alan Greenspan and Paul Volcker. Politicians like Ohio Senator Sherrod Brown, as George Will points out, and Former Utah Governor and Republican Presidential candidate Jon Huntsman have also vehemently argued the inherent danger in the system as is. The danger of big banks is two-fold. First, the six biggest banks in the country – Bank of America, JPMorgan Chase, Citigroup, Wells Fargo, Goldman Sachs, and Morgan Stanley – have combined assets worth approximately $9.4 trillion or 66 percent of GDP. AEI’s James Pethokoukis adds that the megabanks (of which there are 12) also control 69 percent of all industry assets, compared to 19 percent by the 70 mid-sized banks, and 12 percent by the 5,500 community banks. As the U.S. and the world economy have become so interrelated, this creates a systemic risk to worldwide financial markets. If one bank engages in risky financial practices (investing in worthless collateralized debt obligations or amassing $6.2 billion in losses on one trade and then betting against themselves in the derivatives market, for instance), it has the potential to bring down the entire market. This is, in part, what happened during the 2008 financial crisis: Bear Stearns and Lehman Brothers had significant exposure to worthless CDOs and maintained credit default swaps on their books, which could not be paid off. Once those investment banks failed, the impact reverberated throughout the entire market, bringing us to the brink of financial collapse. But that is only part of the inherent danger of megabanks. The second danger is the implicit insurance policy provided by the federal government at the expense of taxpayers. Because of the first danger – a failure of big banks has the potential to bring down the entire American economy – and because of the bank bailouts given to Wall Street in 2009, the precedent allows for (some would even say mandates) a future bailout should the same situation present itself. That bailout – the Troubled Asset Relief Program or TARP – involved buying up toxic assets as well as housing grants, and cost approximately $431 billion. Although this was a lower price tag than the bailout of the S&L industry in the late 1980s, it doesn’t include the takeover of Fannie Mae and Freddie Mac. With those financials institutions now larger than they were, and with only patchwork reform instituted by the Dodd-Frank Wall Street Reform bill (the language of the Volcker Rule still hasn’t been finalized, for instance), the potential for a taxpayer funded bailout still hovers like a cloud over New York and Washington. That brings us back to the politics. Many on the Left have long advocated for breaking up the big banks because of the inherent dangers just discussed. And some on the Right – included Huntsman and George Will as I mentioned, as well as Senator David Vitter and now former Senator Jim DeMint – have advocated the same. But opposition to this type of federal action or regulation has come almost exclusively from the Right, which raises the question, is “too big to fail” fundamentally conservative? There are two components to this argument. The first is ideological: banks are necessary for capital formation and investment, promoting growth and innovation. They are essential to the type of free enterprise economy that Republicans tout. The problem is, they’re not lending, either for individual mortgages or for businesses. As Forbes reports, the banks rejecting the most small business loan applications are Bank of America, JP Morgan Chase, and Wells Fargo, leading many applicants to turn to alternative lenders. With the impact of the financial crisis still reverberating through Wall Street (which was, at least in part, the cause of the crisis), banks have spent the last three years reinforcing their balance sheets through speculative investments and proprietary trading rather than returning to the traditional, safer, and less lucrative commission banking. The second component is political. Support for big banks is seen as support for the very free enterprise system Republicans tout, while advocating breaking up the banks is seen by many as an affront to that system. There is also the issue of campaign donations; while Wall Street supported Barack Obama in 2008, they switched back to Mitt Romney and the Republicans in 2012 by a significant percentage. The top corporate donors to Romney’s campaign read like a who’s who of Wall Street power: Goldman Sachs, JPMorgan Chase, Morgan Stanley, Bank of America, and Credit Suisse Group. But this presents a political problem unto itself. Mitt Romney, who New York Times columnist David Brooks parodied as “Thurston Howell Romney,” presents (or maybe confirms) an image of Republicans as a party of old, white men who support big business and big banks at the expense of the “little guy.” The Republican Party hasn’t come close to expanding its reach by tapping into a populist economic message, one that emphasizes the role and the power of the middle class. That, as much as demographics and a less than stellar candidate, explains the electoral failure of 2012, a point that commentators like Ross Douthat and Ramesh Ponnuru have attempted to make. And this sort of economic populism is not at odds with a conservative message. It accepts the economic value of capital formation, but argues that it should be wielded as a means of expanding middle class growth rather than a risky Wall Street balance sheet. And it is in tandem with a belief that limited government, low taxes, and less regulation provides an economic atmosphere where small businesses can thrive. None of this is meant to demonize bankers. As James Pethokoukis writes, “they’re not ‘banksters’ grifting money from middle-income pockets.” It is just to say that from an economic perspective, the inherent risk from too big to fail banks outweighs the economic benefit, and from a political perspective, the insistence on the part of Republicans to support Wall Street and oppose any reform as an affront to the free enterprise system creates significant electoral challenges that will be difficult to overcome. Breaking up the banks is not without risk or doubt, however. As AEI’s Peter Wallison points out, there are significant questions and unknowns, such as whether the clearinghouse international payment system could continue to operate, how banking for corporations would change, how banks would manage their risk, etc. But the risk is too great to maintain the status quo. The Republican Party isn’t Occupy Wall Street and they shouldn’t be; nor should they act like it. But taking a more aggressive approach as it relates to financial reform and the big banks makes economic and political sense. Tags: Bank of America, big banks, Ezra Klein, financial crisis, Goldman Sachs, JPMorgan Chase, Republicans, TARP, Too Big to Fail. Bookmark the permalink. To be honest I am a conservative with an iconoclastic view of left and right wing parties. The divisions put between them is BS. I am a capitalist. 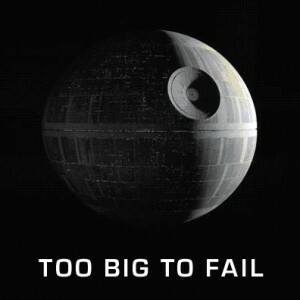 There is no such thing as too big to fail in capitalism. I think it’s great to have mega corporations but when they fail LET THEM! There is no military industrial complex. Just a rising power of state and corporate power. We used to call it Socialism….